More Than Gourmet Glace de Poulet Gold/Classic Roasted Chicken Stock - a 20-time reduction, intensely flavored chicken stock without the salty flavor, resulting in a glace with a rich, deep color & a thick consistency. 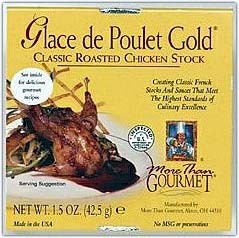 Glace De Poulet Gold produces pure, concentrated flavor & can be used to embellish finished sauces or for deglazing directly in roasting or saute pans. More Than Gourmet Glace de Poulet Gold. The 1.5 oz. container makes approximately 4 cups of chicken stock.